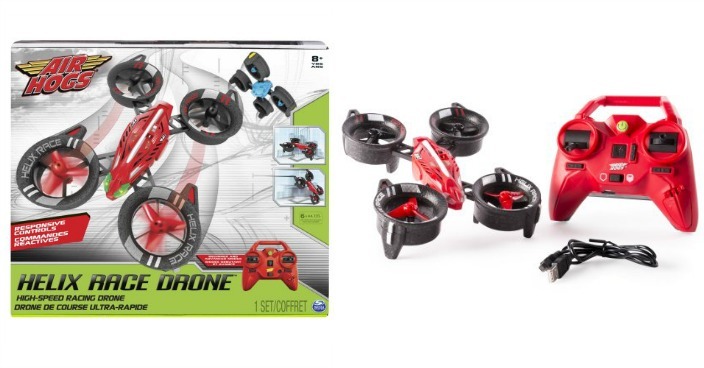 Air Hogs Helix Race Drone Just $39.88! Down From $70! You are here: Home / Great Deals / Air Hogs Helix Race Drone Just $39.88! Down From $70! Right now you can get this Air Hogs Helix Race Drone for just $39.88 (Reg. $70) at Walmart! Own the skies with the Helix Race Drone from Air Hogs! This high-speed racing drone has Beginner and Advanced modes to challenge each pilot as they develop their RC skills. Master aerial tricks thanks to the quick stunt button, and when things dont go exactly as planned youre covered by the crash-resistant exoframe. 2.4GHz remote communications allows you to push the limits even further. Race to any mission with the Air Hogs Helix Race Drone!